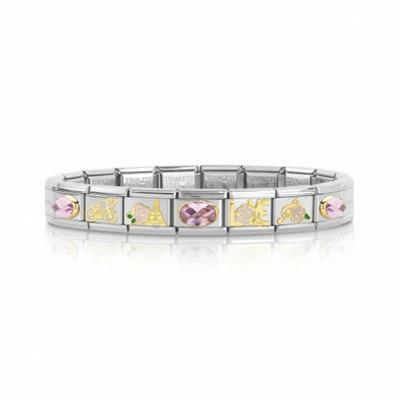 Add a touch or pink to your wrist with this beautiful La Vie En Rose Bracelet from Nomination. This ready to wear bracelet has been created from charms from the La Vie En Rose collection and consists of a stainless steel bracelet, three pink cubic zirconia and 18ct gold oval charms, a Bicycle, Eiffel Tower, Music Note and the word LOVE. Show someone you love them with this beautiful bracelet. It will sit beautifully on its own or alongside other Nomination bracelets.